<strong>The high jump</strong> is an athletics (track and field) event in which competitors must jump over a horizontal bar placed at measured heights without aid of any devices. It has been contested since the Olympic Games of ancient Greece. Over the centuries since, competitors have introduced increasingly more effective techniques to arrive at the current form. 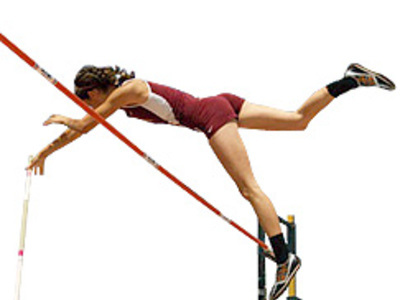 <strong>Pole vaulting</strong> is an athletic event where a person uses a long, flexible pole (which today are usually made either of fiberglass or carbon fiber) as an aid to leap over a bar. Pole jumping competitions were known to the ancient Greeks, as well as the Cretans and Celts, but with these exceptions there is no record of its ancient practice as a sport.